Today, March 16, 2016 the United States Senate protected your right to know about what you are buying and eating. Monsanto supporter Senator Pat Roberts (R-KS) introduced this bill to amend the agricultural marketing act of 1946. The bill would require the Secretary of Agriculture to establish a national voluntary labeling standard for bioengineered foods (genetically modified), and for other purposes. This all sounds harmless but this bill soon became known as the “DARK ACT”. The number one supporter of this bill is Monsanto. They do not want you the consumer to know that the food you are buying to eat is genetically modified and being sprayed with glyphosate (Roundup) or other toxic herbicides and pesticides created by them. Many angry consumers contacted their lawmakers and senators with a massive amount of calls and emails and let them know that they did not want to be LIED to about GMOs (genetically modified organisms) in their food. The DARK Act would have outlawed all state-level GMO labeling laws nationwide, condemning food consumers to remaining completely in the dark over the genetically engineered content of their food. 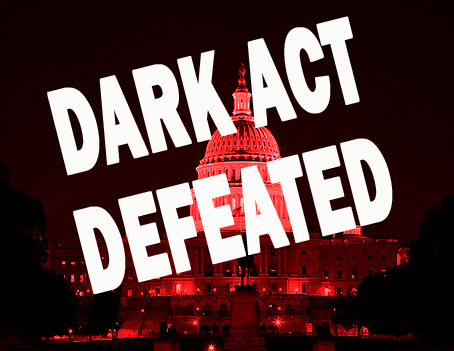 Today’s Senate vote was a massive victory for American consumers and also for the Environmental Working Group which helped organize massive opposition to the Dark Act Senate Bill. Food consumers want and demand honest food labels and overall food transparency. Interestingly there was a flood of calls as the public truly mobilized on this issue. It is truly necessary to watch this more as Senate Majority Leader Mitch McConnell (R-Ky.) flipped his vote from yes to no. He is a true supporter of the DARK ACT, but this was just a procedural maneuver that allows the Senate to bring an amended version of the DARK Act back into the realm of the “un-dead.” This could occur as early as this week, or perhaps in two weeks, after the Senate returns from its recess. The Organic Consumers Association recommends that we remain alert and strong with respect to this issue, especially since it may be before the Senate again. 3. The people of Vermont shouldn’t have to wait for the food companies to voluntarily label GMOs or for the federal government to write regulations. Vermont’s GMO labeling law must be allowed to take effect on July 1, 2016. It is important to reach out and thank those Senators who voted for consumers, not Monsanto, today. Please click here to see how your Senators voted and then call the Capitol switchboard at 1-202-224-3121. ALERT: “It has been reported that Sen. Debbie Stabenow (D-Mich.) is floating an alternative to the DARK Act.” It’s really time to let all politicians know that it is not right to do the devils work and accept handouts from Monsanto.